A shopper in the ice cream aisle pulls out a tub of mint chocolate chip and hesitates as she notices ice cream scoops hanging from a display on the freezer door. Ah ha, she thinks, it would be nice to have a real scoop instead of always using a spoon. Into the cart goes a scoop, along with the ice cream. 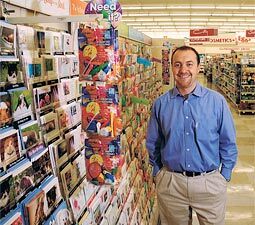 Shoppers don't mind spending a few extra dollars on items that aren't on the list, and that's what Ty Bennett, 1995 Washington State University alumnus and pioneer in the impulse buying business, counts on. "We didn't invent [impulse buying]. We just reinvented it," says Bennett, president of ATA Retail. 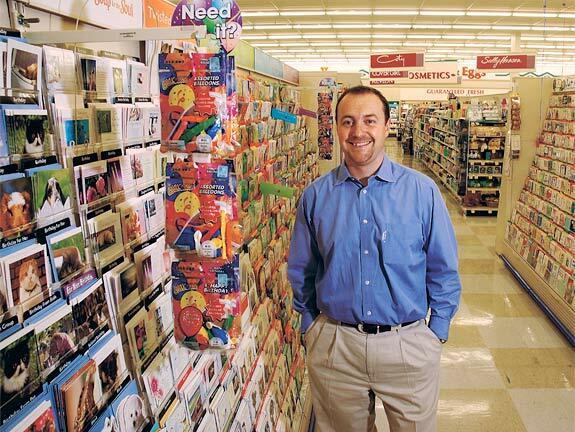 His company is responsible for the displays of corkscrews in wine aisles, chip clips in snack aisles, balloons in greeting card aisles, and countless other impulse items in supermarkets and drug stores across the country. In 1991, Bennett teamed up with his father and stepbrother to pursue his father's business idea. The company they set out to create would take over the small hanging displays in store aisles, which were costly and labor-intensive for individual stores to stock and maintain. "We didn't know anything. We had nothing to lose," says Bennett, who was originally just looking for a job with a real salary when he finished studying economics at WSU. He thought maybe he would go to Seattle and take a safe job in banking. But he recognized that this high-risk opportunity to start a business also had a potentially high reward. So he took the leap and moved to California, where his business adventure began. At first, the company struggled to convince retailers that ATA Retail could do a better job with impulse items than the stores were doing themselves. Establishing credibility as a new company was tough. Plus, as a company in an entirely new niche, Bennett knew that building rapport with major supermarket chains would take time. Sales quickly became Bennett's specialty, mainly because others in the company didn't want to tackle them. The work has paid off. After years of refinement, ATA Retail has grown to employ over 11,000 people and currently services 5,600 stores in 43 states. Today, ATA Retail leads the nation in its category. Bennett attributes his company's success to having very dedicated people who are willing to do what it takes to please retailers. ATA Retail doesn't just supply items to supermarket chains, the company provides a complete service by selecting products, providing hardware, and stocking and restocking displays. Before the ice cream scoop or corkscrew makes it into a shopping cart, a substantial amount of work has been done. Bennett has maps of each store he supplies, so that items can be individually labeled with their appropriate aisle location before they leave the warehouse. Warehouse employees pack items for each order according to the maps, ensuring that products make it to the right spot. ATA Retail employees meet the shipments at the store and stock the displays weekly. There is nothing glamorous about the work, he says, and that almost led him away from the business in the mid 1990s. High-tech jobs were growing, and he watched his friends make money working for Internet startups. His business seemed "so yesterday." But now he's happy he stayed, especially after watching the Internet boom come and go. Experiencing the satisfaction that comes with growing his own business can't be beat. Looking back at the path he's taken, Bennett remembers bagging groceries as a teenager at Rosauers in Spokane. He never would have guessed that he'd return to make a sales call as the president of ATA Retail.